These Black glutinous rice Angku Kuih was made quite some time ago but I had to put the post on hold as I was pre-occupied with the posts for Chinese New Year Cookies. The dough was prepared a day before and kept refrigerated till ready for use. 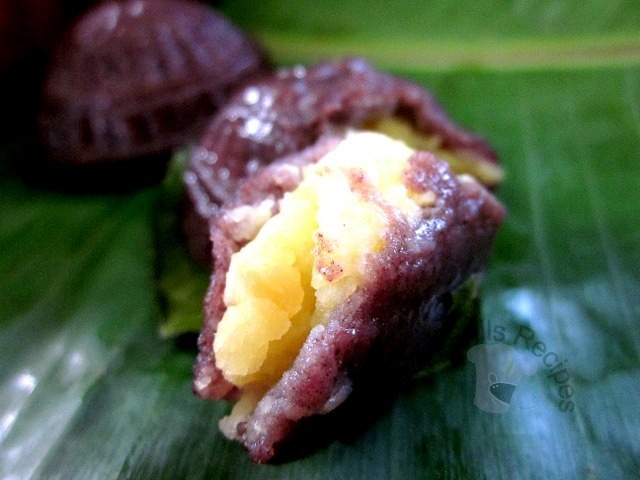 These angku kuih was soft and chewy and I must thank Happy Flour for sharing this recipe. Soak the beans overnight, steam for 35 to 40 mins. or till soft. While hot, blend the beans with 1 cup of water. Heat up oil in a pan and fry the bean paste with sugar till it forms into a paste, leave to cool. Mix all the ingredients together, knead to form a soft dough, adding in water sparingly. Wrap wiht clign wrap and rest in the fridge for 1 to 2 days. (This is to allow the flour to absorb the liquid). Let dough rest in room temperature, knead before use. (If dough is dry, add water, if dough is wet, add some glutinous rice flour). 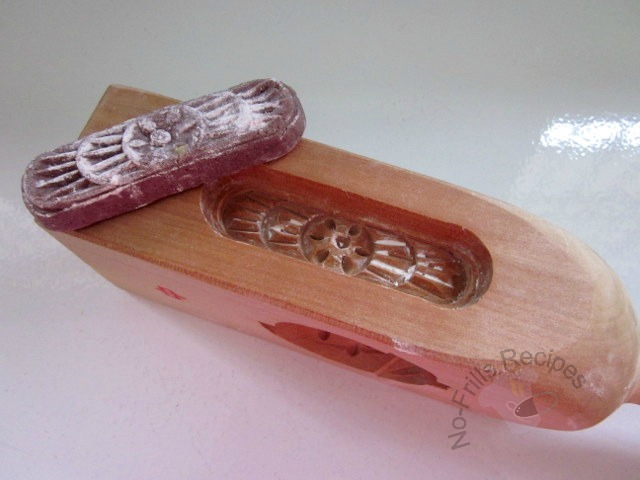 Dust the mould with some rice flour. Pinch some dough to form a ball, flatten, put in the filling, wrap up into a ball and place the ball of dough into the mould. Press it in a bit and knock out the kuih. Place the kuih onto a greased banana leaf. Steam under medium heat, small kuih for 3 mins. while the big ones take 6 mins. Remove the kuih and immediately brush on some oil. Note : Small kuih - 15 gm dough/15 gm filling. Big kuih - 50 gm dough/50 gm filling. Very nice and soft AKK. 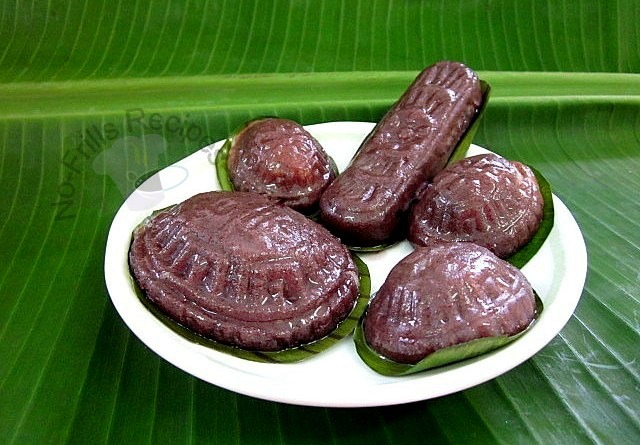 By the way I've never seen black glutinous rice flour before. Is it from the black glutinous rice that we normally cook as dessert? Yes it is and I can get it in 'powder' form here. I was wondering to find a recipe to finish my balance of black glutinous rice flour before it expired . 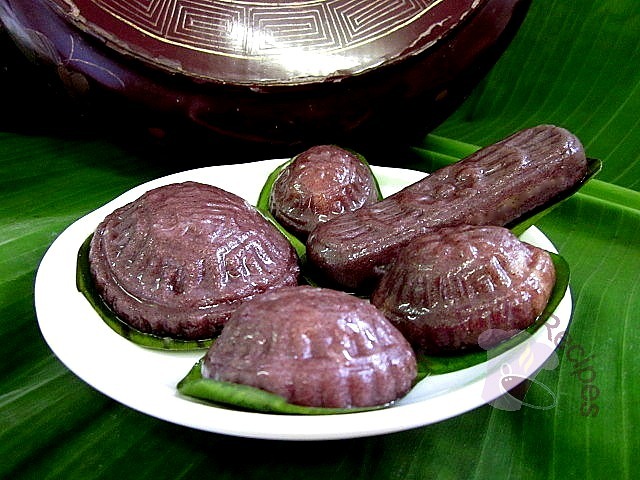 Your yummy Black Glutinous Rice Angku Kuih just at the right time , here I go ........Thanks ! I would love to get my hands to try this special AKK. I got to look for black glutinous rice first. Bet this AKK must be yummy and tasty usi g the black glutinous rice flour. Yes, they're yummy and chewy. Will look forward to your post soon! Soft and chewy...they sound and look very tasty, Cheah. Yes, more so freshly steamed, Angie! Hi Soke Hah, yes must thank Happy Flour for sharing the good tip. I used the same method for other AKK recipes. They are soft and chewy. My mum asked to make more. Yes, Kimmy, that was indeed a very good tip. Thanks for the recipe, makes me drooling, must try ! Hi, Paulie, thanks for dropping by. Please try this out! Yes, why not.... it's fun to experiment with different ingredients. Very nice black AKK and the mould is so pretty! Una buena forma de ocupar el arroz ingeniosa receta,abrazos.